What Day Of The Week Is October 28? 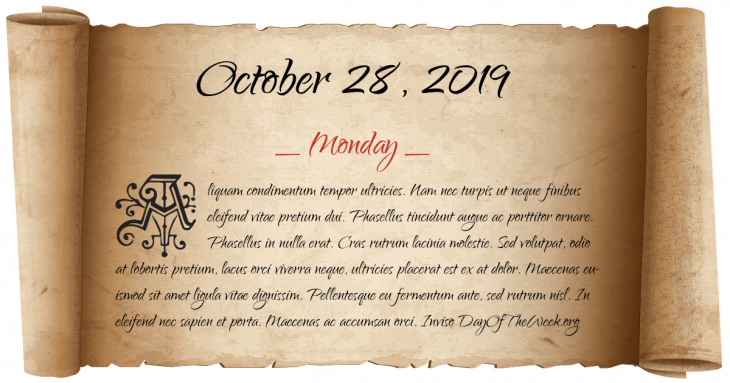 October 28, 2019 is the 301st day of the year 2019 in the Gregorian calendar. There are 64 days remaining until the end of the year. The day of the week is Monday. Here’s the October calendar. You can also browse the full year monthly calendar. Emperor Nerva is forced by the Praetorian Guard, to adopt general Marcus Ulpius Trajanus as his heir and successor. Battle of Yaunis Khan: Turkish forces under the Grand Vizier Sinan Pasha defeat the Mameluks near Gaza. American Revolutionary War: A British proclamation forbids residents from leaving Boston. American Revolutionary War: Battle of White Plains – British Army forces arrive at White Plains, attack and capture Chatterton Hill from the Americans. In New York Harbor, President Grover Cleveland dedicates the Statue of Liberty. Tchaikovsky’s Symphony No. 6 in B Minor, Pathétique, receives its première performance in St. Petersburg, only nine days before the composer’s death. Declaration of the Youth Pledge in Indonesia, the first time Indonesia Raya, now the national anthem, was sung. Britain launches the satellite Prospero into low Earth orbit atop a Black Arrow carrier rocket, the only British satellite to date launched by a British rocket. The Spanish Socialist Workers’ Party wins elections, leading to the first Socialist government in Spain after death of Franco. Felipe Gonzalez becomes Prime Minister-elect. Cristina Fernández de Kirchner becomes the first woman elected President of Argentina. Who were born on October 28?